For other people named Nick Rhodes, see Nick Rhodes (disambiguation). Nick Rhodes (born Nicholas James Bates; 8 June 1962) is an English musician, singer and producer, best known as a founding member and keyboardist of the new wave band Duran Duran He is also informally monikered as "The Controller", after being introduced as such on stage by band mate Simon Le Bon during the Astronaut album world tours of 2004-2005. He is the youngest member of the original lineup. Rhodes has been involved in several side projects outside of, but related to Duran Duran: he released albums with Arcadia in 1985 (featuring 3 members of Duran: Rhodes, Simon Le Bon and Roger Taylor), and recorded and performed as The Devils in 2002 with Stephen Duffy, longtime musical friend and the original lead singer of Duran Duran. In March 2013, he released the TV Mania side project with former Duran Duran guitarist, Warren Cuccurullo. Nicholas James Bates was the only child of well-off parents who were the owners of a Birmingham toy shop. He attended Woodrush High School in Wythall, north Worcestershire. He and John Taylor (from the nearby village of Hollywood) formed a band called 'RAF'. Bates left school in 1978 at the age of sixteen, and founded Duran Duran with school friends Stephen Duffy (vocals), John Taylor (who then played lead guitar), and Simon Colley (bass). Rhodes reportedly owns the Duran Duran name; this was mentioned in the Andy Warhol diaries. Warhol told his diarist Pat Hackett that Duran Duran had split up (in 1986, Andy Taylor and Roger Taylor left the band, returning in 2001 to reunite and create the Astronaut album) "but Nick owns the name so it's still Duran Duran". At about the same time as the name Duran Duran was chosen for the band, Nick Bates decided to change his stage name, which was given to him by John Taylor before the first interview they had together for their band. He cited a dislike for being called Master Bates and chose the name "Rhodes" after the brand of electric piano. As the band coalesced into its final line-up in 1979-80, Duran Duran started playing at a local Birmingham club called "The Rum Runner". The club owners became the band's managers, and Rhodes began working at the club as a disc jockey. The band achieved rapid success, and Rhodes was a driving force throughout. An unschooled musician, he experimented with the sounds his analogue synthesisers were capable of, but shied away from the "novelty" sounds of some other early synth bands. 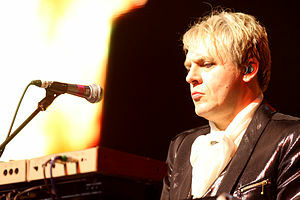 The distinctive warble of "Save A Prayer", the keyboard stabs of "A View to a Kill", and the string sounds of "Come Undone" and "Ordinary World" are some of his most recognisable creations, as well as the futuristic oscillating synth that characterised Duran Duran's self-titled first album. He popularised the Crumar Performer on the early records. Rhodes was also quick to recognise the potential of the music video, and pushed the band to put more effort into their early videos than seemed warranted at the time (before the advent of MTV). Barely twenty when the band hit major stardom, he cultivated an androgynous and sometimes flamboyant image, wore heavy makeup, and changed his hair colour at whim. By the late 1990s, Rhodes had begun writing lyrics for Duran Duran, as well as music. His digitally altered voice is heard on the title track to the 1997 album Medazzaland. In 2001, the original five members of Duran Duran reunited to record new music; see Duran Duran for details. Rhodes studied production techniques while in the studio with Duran Duran, eventually helping to mix several tracks on the Rio album, and was a co-producer on many of the band's later albums. In early 1983, he discovered the band Kajagoogoo and co-produced their debut single Too Shy which became a UK no.1 (prior to any of Duran's singles reaching no.1). Rhodes and Warren Cuccurullo wrote and produced three tracks for the Blondie reunion album in 1996; the tracks were not used, but one song called "Pop Trash Movie" was later recorded by Duran Duran for the 2000 album Pop Trash. In 2002, Rhodes co-produced and played additional synthesizers in nine tracks of the album Welcome to the Monkey House by The Dandy Warhols. In 2004 he produced British-based pop group Riviera F for their debut EP International Lover, published on Pop Cult/Tape Modern (Rhodes & Stephen Duffy’s label). With his bandmates Simon Le Bon and Roger Taylor, Rhodes formed the side project Arcadia while Duran Duran was on hiatus in 1985. The band had a moody, keyboard-heavy sound, far more atmospheric than Duran Duran (or the hard rock of the other Duran splinter group of 1985, Power Station). The band scored a major hit with "Election Day" and the band's only album, So Red the Rose, went platinum in the US but was less successful in their native UK. The band never toured and was dissolved when Duran Duran regrouped in 1986. In 1999, Rhodes reunited with Duran Duran's original vocalist, Stephen Duffy, to create new music based on some of the earliest Duran music the two had written together. The result was the album Dark Circles, released under the name The Devils. Also in 1999, Rhodes had a small guest appearance (in voice only) as a Canadian bomber pilot in South Park: Bigger, Longer & Uncut. In 2006 Rhodes and John Taylor collaborated on the compilation album Only After Dark. In 2011 Rhodes along with Andrew Wyatt and Mark Ronson remixed Depeche Mode's Personal Jesus for the British electronic band's remix compilation Remixes 2: 81-11. Also in 2011, Rhodes wrote the afterword to the award-winning '80s 7-inch vinyl cover art book Put the Needle on the Record. In March 2013, TV Mania made up of Nick Rhodes and ex-Duran Duran guitarist Warren Cuccurullo, released Bored with Prozac and the Internet?. Throughout the 1990s, Rhodes worked on this side project with Cuccurullo. To support the launch of the project, Rhodes had an exhibition of his photography, BEI INCUBI (Beautiful Nightmares) at The Vinyl Factory in Chelsea, London on 7 March 2013. Rhodes met Julie Anne Friedman (heiress to the Iowa, USA Younkers Department Store fortune) at a yacht party while on an American tour in 1982, and married her on 18 August 1984. They have one daughter together, Tatjana Lee Orchid (born 23 August 1986). After a brief separation and an attempt to reconcile, they filed for divorce in 1992. Rhodes has had several long relationships with various women but has not remarried. Rhodes, as a former art student, became enamoured of the art world early in his career, making friends with famed "Pop" artist Andy Warhol and The Factory crowd, and attending exhibitions worldwide. At the end of 1984, he released his own book of abstract art photographs called Interference. Many of the photos were displayed at an exhibition at the Hamilton Gallery in London. He continues to showcase photography on occasion, including in British magazines such as Tatler and also occasionally appears at the Cannes International Film Festival. In November 2011, Rhodes received an Honorary Doctorate of Arts degree from the University of Bedfordshire, for his services to the music industry. Rhodes appears in Burke's Peerage under his second cousin's entry for the family of Lindley-Highfield of Ballumbie Castle, being related to the Highfield family through his paternal grandmother, Irene Lavinia Bates (née Highfield). Rhodes is a long time vegetarian and occasionally, a fish eating pescatarian. In a 2012 interview at DuranDuran.com he cited Italian, Lebanese and Indian food as his favourites. He moved to central London two years after Duran Duran's success and continues to reside there. ^ a b George-Warren, Holly; Romanowski, Patricia; Pareles, Jon. The Rolling Stone Encyclopedia of Rock & Roll. Rolling Stone. ISBN 978-0-7432-0120-9. Retrieved 30 January 2010. ^ Gillis, Kathy (12 October 1985). "Arcadia:The Rest of Duran Duran". Billboard. Retrieved 30 January 2010. ^ Rees, Dafydd; Crampton, Luke (1991). Rock movers & shakers. ABC-Clio Inc. p. 1944. ISBN 978-0-87436-661-7. ^ Newman, Melinda (1 February 1997). "The Beat". Billboard. 109 (5). ISSN 0006-2510. Retrieved 30 January 2010. ^ "On The Grid". London Evening Standard. 23 April 2004. Retrieved 30 January 2010. ^ Creative camera, Issues 241-52. Creative Camera magazine. p. 36. ^ "Lindley-Highfield of Ballumbie Castle". Burke's Peerage. 6 October 2010. Retrieved 5 June 2015. This page was last edited on 15 February 2019, at 06:00 (UTC).